Tribes of Legend may not be the first fantastical product from Foundry, but it seems to have been a catalyst for them to launch a new Fantasy-focussed website. 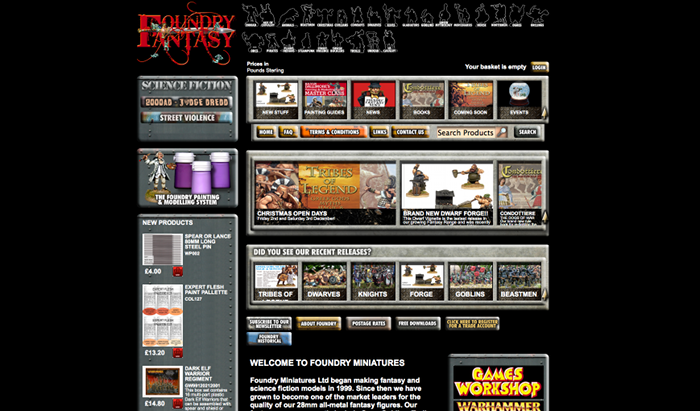 Whilst Foundry are known as a producer of historical figures, they actually have a huge range of fantasy models too. This new site allows these ranges to have their own place in the sun, rather than hiding under the shadow of the even more vast historical ranges. Three other things are worth mentioning. Firstly, the site is still being tested, and they’d be very happy to hear if you find something that doesn’t work as you’d expect. I use Firefox and that’s turned up a couple of issues that aren’t present in IE9, for example. But don’t let that stop you having an explore. Finally, the first sets of figures from the Tribes of Legend model range are out! This entry was posted in Tribes of Legend. Bookmark the permalink.